I am working on 4th of July party food ideas. I will have Sewing Sister and my nieces with me, and we want to do a good picnic at the beach and watch fireworks. I think the adults will need a refreshing cocktail to balance out the meal. I first made this vodka sparkler when Aunt B was here last year. At that time, we used strawberries and peaches. At the swim meet last week, I mixed it up again using blueberries and peaches. Either fruit combination will be perfect for July 4th! 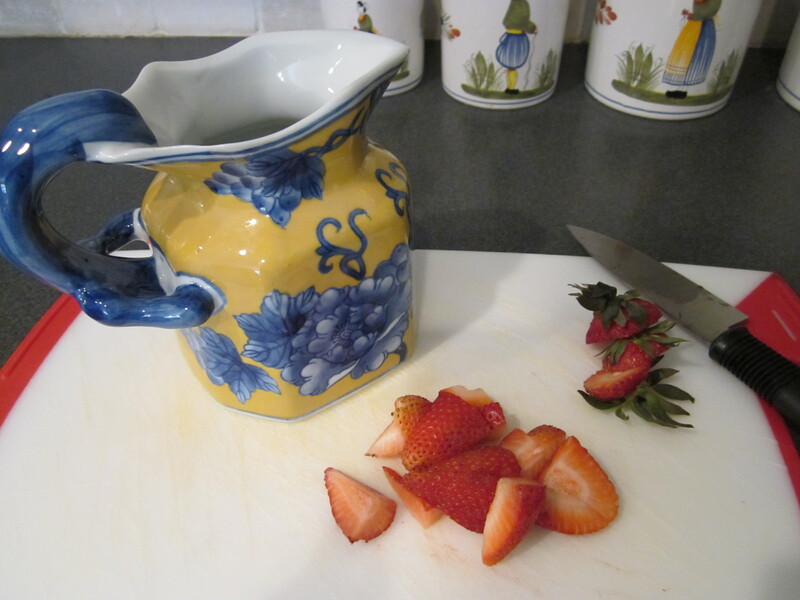 Cut 10 strawberries into bite sizes and place in a pitcher OR put blueberries in a pitcher. Cut the peach into bite sizes and add to the pitcher. Pour vodka over the fruit and let steep in the refrigerator 3+ hours. 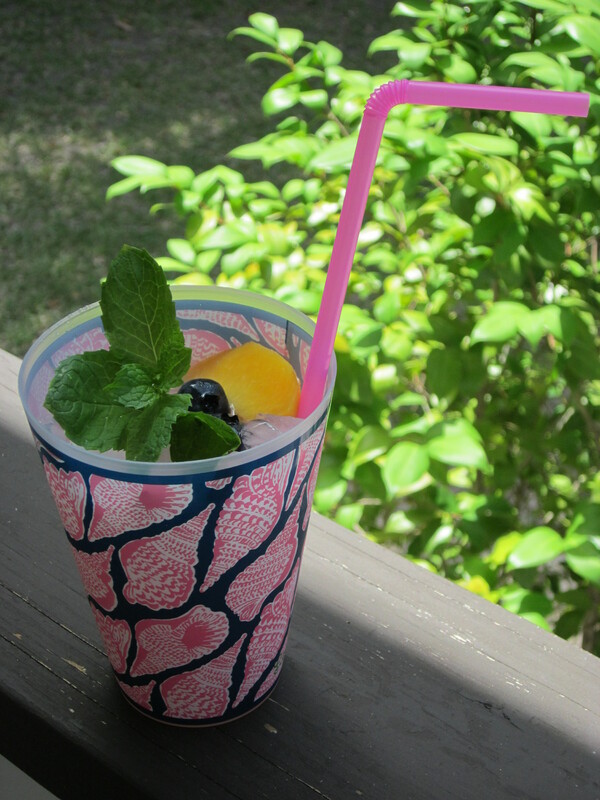 Garnish with a mint sprig and a slice of strawberry (or a few blueberries) and serve. The color of the strawberries leeches out while sitting in the vodka, so it is not very pretty to leave the soaked fruit in your cocktail, but you certainly can. The blueberries retained their color, so I did use the vodka soaked blueberries as a garnish in the blueberry version. Sonic Drive-In sells their really good pellet ice by the bag, cup, or will even fill your cooler! It is the perfect ice if you are making this cocktail in picnic/tailgate conditions. 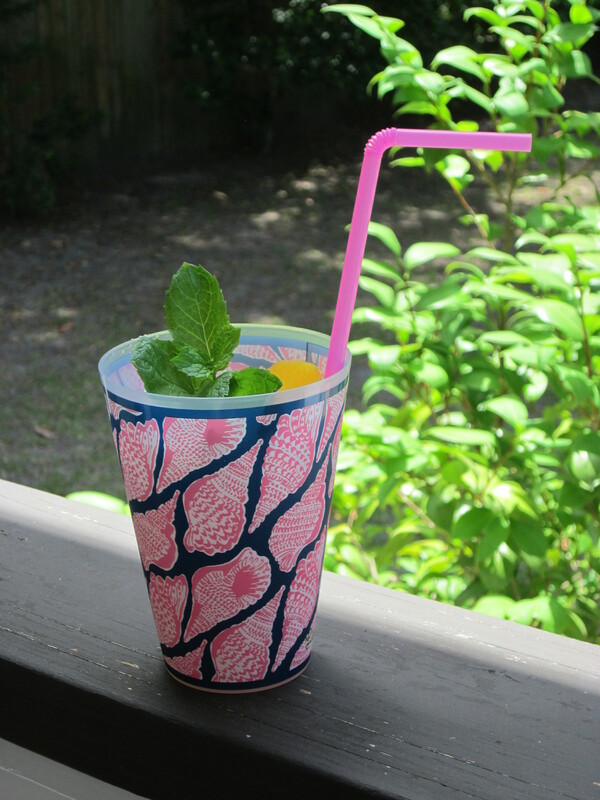 I find Reusable Tumblers and colorful straws add a nice touch too. Yummy! This sounds like the perfect summer adult beverage! Have fun with the sewing sister and family! I’m so excited to make is one!! I was sucking them down pretty fast at the swim meet because it was unbearably hot, and I was getting dehydrated quickly, and they are so refreshing. They will sneak up on you! This was a huge hit for the 4th of July!! What fruit combo did you use for the vodka? I think I liked the strawberry/peach better than blueberry/peach.